The Indian Mujahideen is a shadowy Islamist militant group based in India, which has been blamed for a string of deadly bombings in recent years. There are few concrete details about the organisation, which has managed to keep a low profile despite focusing its fire on soft targets in India's urban centres. Indian security analyst Praveen Swami calls it "the most lethal urban terrorist group" since the Mumbai train bombings of 2006 in which 187 people were killed and there are suggestions that the group may even have had links with that attack. But it has been explicitly blamed by police for several other recent attacks, the biggest and boldest of which was a string of blasts in Jaipur in 2008, which killed at least 63 people. After that attack, an email sent by the then little-known group claimed responsibility and made it clear it wanted to establish home-grown Islamist militancy in India. Since then, they have been held responsible for a long and deadly list of attacks, but it was only after the attack on the famous German Bakery in Pune in 2010 that India outlawed the group and the authorities began to prioritise cracking down on such home-grown militant outfits. The US followed suit the year after and the UK outlawed it in 2012 when a minister told parliament that the group "has frequently perpetrated attacks against civilian targets "with the intention of maximising casualties". Emails purportedly sent about the group are certainly vituperative, with messages condemning so-called "infidels" and calling on people to accept Islam or face death. Their bombs are generally simple, wired to timing devices and with ball bearings designed to cause serious injuries. Information about the origins of the group is scarce but Praveen Swami sets out what information there is in this piece from 2010. Many of the details were provided by Sadiq Israr Sheikh, one of the few founding members of the group in custody, and they paint a picture of clandestine meetings and provide an insight into how the group began to forge links with other militant groups, including Pakistan-based outfits. The Indian Mujahideen is thought to have begun militant operations in earnest sometime around 2006-2007. Analysts say that at its core was a group of disaffected young men who had already been meeting for several years and who were allegedly inspired by the ideology of the Students Islamic Movement of India (Simi). This small and tight-knit group of men included Yasin Bhatkal, who has been arrested, and two ideologue brothers from a coastal town of Karnataka, also named Bhatkal, an area which has seen tensions between Hindus and Muslims. Riyaz Shahbandari (also known as Riyaz Bhatkal) and his brother Iqbal Shahbandri (also known as Iqbal Bhatkal) are still among the most wanted men in India. Preparations for concerted militancy began with the men practising shooting with air guns, holding ideological classes and making home-made bombs, says Mr Swami in his article for firstpost. He says that from safe houses in Vitthalamakki and Hakkalamane in Karnataka, bombs were despatched to operational cells dispersed across the country, feeding "the most sustained jihadist offensive India has ever seen". Other experts such as Shishir Gupta, author of a book on home-grown militancy, have argued that these home-grown militant outfits also fed off critical links within Gulf states where they were inspired by militant ideologies preached there. Reports say that for a period of time operations for the Indian Mujahideen were even moved to Saudi Arabia. 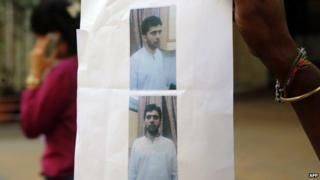 Riyaz and Iqbal Shahbandri are also alleged to be out of the country, possibly in Karachi. Many agree that the group is part of a larger militant network across India but the strength and exact nature of the associations with jihadist groups such as Harkat-ul-Jihad-e-Islami (Huji) and Simi is still unclear. Some intelligence sources told reporters in 2008 that the Indian Mujahideen was simply a new name used by groups banned by the government in recent years. Others have suggested they are simply an Indian face for groups working out of Pakistan. Nevertheless their actions were planned under the radar of India's security agencies, and the authorities have been forced to act. Over the last year there have been several reports of arrests of key IM operatives beginning with three members held on 27 December 2012. But analysts warn that the arrest of Yasin Bhatkal may not spell the end of this organisation, as it is likely to have junior operatives waiting in the wings to take over its militant campaign.